Live Free or Die: Are New Hampshire’s Colonial Barns Merely a Thing of the Past? The Village of Bath offers the triple crown of New England photo opportunities. Within just feet of each other Bath has the oldest general store in the country, a white-steeple, a country church, and a covered bridge that spans the Ammonoosuc River. This is the New England of postcards. The village is nestled in a valley of rolling farmland in northern New Hampshire and, much like some of the state’s other rural communities, Bath offers a nostalgic look back at simple, clean, country living. For those tourists who flock to this part of the country during the foliage season, Bath is a town blessed with these and other highly identifiable New England portraits. And while just a drop in New Hampshire’s population bucket–932 at last count–Bath is a huge blip on any foliage lover’s radar screen. Bus loads of “leaf peepers” descend on the village each autumn to get a glimpse of what they want New Hampshire to be: a safe haven from the perils of the 21st century. New HampshireThe Brick Store is steeped in the aromas of homemade smoked cheddar and assorted meats. The covered bridge is a sturdy reminder of reliability and the Bath Congregational Church evokes a sense of strong neighborly bonds between community members. Still, although the village itself produces such warm sentiments in its visitors, another landmark of New Hampshire’s traditions is just down the road–off the beaten path. That symbol is the colonial family barn. Big, red and almost defiant in its straight-forward design, this particular barn belongs to the Minot family–operators of a struggling seven-generations-old dairy farm–though theirs is but one of many around the state. Tourists rarely step down from their buses or park their SUVs to go sifting through cow stables and haylofts, but still the New Hampshire barn is ever-present in the background of New Hampshire memories, rarely sparking a strong reaction, but always lurking somewhere in the camera’s view-finder. Not many people load up the car for a “good barn touring weekend,” nor are there many catchy T-Shirts targeting the barn loving community: “Is That a Silo in Your Pocket, Or Are You Just Happy to See Me?” But these old barns are as much a part of New Hampshire’s scenic reminders as the general stores, covered bridges and white-steepled country churches. The thought of losing these historic buildings has started to disturb a number of people throughout the region, as the Division of Travel and Tourism Development takes stock of what tourists expect to see when driving through the Granite State. Tourism is the second largest revenue generator in New Hampshire’s economy; as such, it is important to keep New Hampshire quaint and its barns upright. According to the Division of Travel and Tourism Development, that industry employs over 68,000 people who, directly or not, tend to the 27 million visitors who spend upwards of $3.7 billion per year. And although some of those visitors are coming up to hit the ski slopes in winter, most come through the state during the summer and fall. “People don’t come up to New Hampshire to look at McDonald’s,” said John Porter, from the University of New Hampshire’s Cooperative Extension and coauthor of Preserving Old Barns–Preventing the Loss of a Valuable Resource. “They come up here to look at the rural, rustic environment and barns typify this. When some of these old structures come down you really miss them, it doesn’t seem the same when you go driving around.” The barns of yesterday may not be around tomorrow as more and more of these once solid structures start to crumble into disrepair. They are expensive to restore if not maintained properly and the barns of the 1800s still used on today’s working farms are slowly becoming out-dated as newer technologies help farmers cut down on some of their labor-intensive work, bringing with them a new, more open type of barn.A recent campaign to save some of the state’s cultural legacies has resulted in the New Hampshire state legislature passing a law this summer, helping owners of historic structures with property tax relief. The theory behind this new law is to prevent barn owners from avoiding sometimes expensive renovations because of the fear of a higher property tax bill. [Editor’s note: New Hampshire is one of the few states in the nation without a state income tax. To make up for this, property taxes are notoriously high.] In the past, some of these people have let their barns deteriorate into a pile of rotting lumber simply because of financial concerns. One popular and creative way of getting rid of the barn in the back yard was to set it on fire in order to give the local fire department practice extinguishing structural blazes–allowing parts of New Hampshire’s history to literally go up in smoke. The origins of these endangered buildings goes back to the earliest days of colonialism in these parts. As settlers migrated to central New England in the 1600s, the unspoiled forests provided plentiful timber for farmers to start their homesteads. With readily available lumber came the notion of constructing larger barns than many had before, using the space to store not just grain and feed, but also the family’s livestock. For over two centuries the typical New England barn was what they called an “English barn”–usually a thirty by forty, one-level structure made with a hand-hewn wooden frame and a simple gable roof. As these simple structures became more inadequate for farmers looking to commercially produce their wares, the barns began to expand in size and shift in configurations. In the 1820s farmers started to construct their barns with open cellars that could handle removing manure easily from the stables on the main floor. By the mid 1800s, farmers were building three- to four-story barns for ever more grain, livestock, and hay storage. Of course all of these barns were built without planning for a future defined by mechanized farming tools or bothersome state health inspectors. This means it’s difficult to adapt may of these buildings to modern farming needs. The father and son team of Bill and Will Minot make up the sixth and seventh generation of that family, respectively, to work their 300-acre dairy farm in one of the many outlying meadows of Bath. The scenery on the Minot farm is one that could grace a New Hampshire postcard. A country road winds its way toward the farm as cows lazily mill around pastures dissected by low stone walls. At the heart of the Minot farm’s operations, both physically and economically, is the barn, built in 1802 by Samuel Minot, who “cleared the place,” according to Bill, the elder of the two. The barn is impressive in both its stature and its connection with the family history. Bill is an easy-natured man with a long, bushy salt-and-pepper beard. He shows off the barn with great pride that produces an eagerness to understand his family’s domain and livelihood. His son Will is a more serious, stockier, and younger version of the father. Will seems always ready to work–the barn is not just part of Will’s heritage, but it’s also deeply connected with his future financial well being. In fact, the duo is now in the process of buying out Arthur Minot, the 76-year-old, fifth-generation farmer, who has recently retired from the dairy business. Bill and Will constitute the entire full-time work force, caring for and milking their 54 Holstien cows and tending to their fields. It’s back-breaking work, skirting through the basement stables with heavy wheel-barrows full of grain, spreading out the hay with pitch forks, and pushing around the large, slow-moving animals. The two get some help from modern technology, but the barn itself prevents them from taking advantage of luxuries like automatic feeders and the latest air ventilation systems. “Being somewhat lazy I don’t mind using things with hydraulics and gasoline,” 50-year-old Bill says with a mix of self-effacing humor and satisfaction, as he logs in 14-hour days–18 hours during harvest (the Minots farm their all the feed for their cows)–through biting cold winters and oppressive summer heat. The Minot day starts at 5 A.M. with first milking, and finishes at about 7 P.M., if all goes smoothly. With more efficient technology, the Minots could maybe cut those hours down; however, one important obstacle stands in the way: the barn. While the thought of a larger barn with more open space on the ground floor for the livestock would be ideal, the price tag for such an upgrade is too steep as many dairy farmers around the state deal with extremely low dairy prices and razor thin profit margins. Like other dairy farmers in New Hampshire, the Minots begrudgingly rely on government subsidies, however, that financial support still makes the choice between building a new barn or keeping up with the bills an easy one. And although President Bush’s latest farm bill has some money allocated to help farmers like the Minots, the gears of government turn slowly. And with the farmers gone, there is also a great risk of losing the history and beauty of the barns to decay or scrap. Ernie LaBombard grew up in Hanover and as a child, he remembers, his favorite playground was an abandoned colonial barn on the outskirts of town. It was a gold mine for any child to explore, filled with dirty nails, sharp edges, and other dangerous things mothers warn their kids about. One day, when heading to the antique “jungle gym,” Ernie came upon a terrible surprise–the local fire department had doused the structure and set it ablaze in order to sharpen their rescue and extinguishing skills. This memory stuck with LaBombard as he would later join his brother Jesse in a business to restore and save old barns from a similar fate. 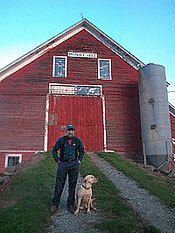 In 1984 the team started the Great Northern Barns company, which is headquartered in Canaan, New Hampshire. Today, the LaBombard brothers buy the barns that nobody wants and dismantle them, with the intention of rebuilding them elsewhere. “We take the barns that people look at and think, ‘My God what a piece of junk,’ where I can see what is possible and try and save it,” Ernie said. “The older the better.” Once meticulously dismantled–categorizing each piece of wood as though on an archeological dig–the company will either store the frame and wood siding or ship it off to some of their clients who are looking to reuse the structure for their house or office. 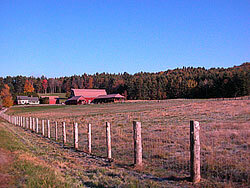 Great Northern Barns can attend to about 20 barns a year and have them relocated all across the country. The company has moved barns to Texas and as far as Oregon. However, when asked where most of these old barns go, without hesitating, Ernie replies, “to people with money.” Because the work is highly technical and the material is unique, the barn restoration industry is big business. 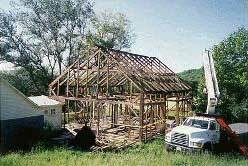 A standard English frame, that is 30 feet by 40 feet, can range from $24,000 up to $75,000, depending on the work it needs. Often times these pieces will be shipped to pockets of wealth like Greenwich, Connecticut, or the Hamptons, on Long Island. Ernie estimates that about one-third of his restructuring projects are for second homes, another third for first homes, and the rest for barns or workshops. And while many barns around the state are slowly crumbling, preservationists are scrambling to help owners with their up-keep in an effort to ensure New Hampshire’s past will be part of New Hampshire’s future. One group, the New Hampshire Preservation Alliance, is working to establish a statewide registry so that the owners start to realize what they have, and almost more importantly, what they could have if properly maintained. So far that effort is gradually moving along–the group has about 30 properties listed for historic preservation purposes. Although the colonial barn is very much part of the New Hampshire wallpaper, it means many different things to people throughout the region. For the tourist, it is a small piece of the puzzle of how people used to live and work. For the farmer, it is crucial infrastructure and one of the continuing costs of doing business. For those who make their living off the people visiting the state, it is a precious commodity that must be preserved.